Accepting Differences | Kid Reporters' Notebook | Scholastic Inc.
Van Dusen’s latest picture book, Hattie and Hudson (Candlewick, 2017), is about a girl and her friendship with a dragon. The book emphasizes the importance of accepting and standing up for others. It is the first time that Van Dusen chose a female for the main character. “I thought that boys could relate to the ferocious dragon, and girls could relate to the strong girl,” he said. Van Dusen describes himself as “an illustrator who sometimes writes.” In all of his books, he hides a character named Mr. Magee, who is based on himself, in the illustrations. 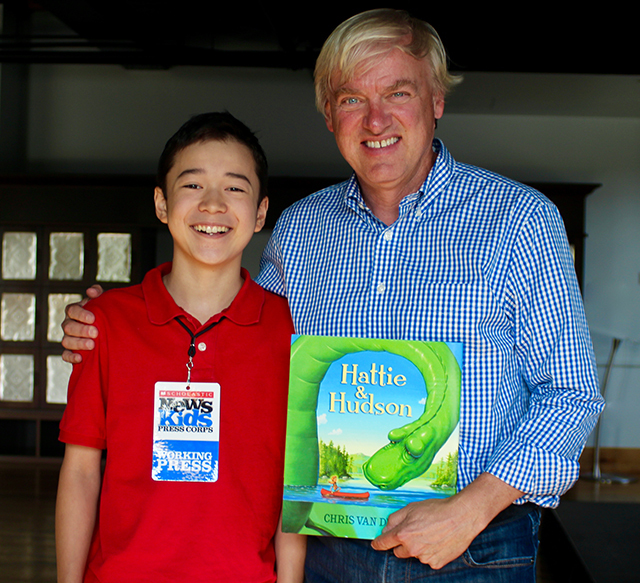 Hattie and Hudson is the first book he has written that does not rhyme. He rewrote the story nine times, he said, before he got it right. Van Dusen, who lives in Camden, Maine, with his family, studied fine arts in college. After working as a freelance illustrator for children’s magazines, he wrote and illustrated Down to the Sea with Mr. Magee (Chronicle Books, 2000). Since then, Van Dusen has written and illustrated several other titles, including The Circus Ship, If I Built A Car, and If I Built a House. He also illustrated President Taft Is Stuck in the Bath by Mac Barnett, and the Mercy Watson and Tales from Deckawoo Drive series by Kate DiCamillo. I get them from dreams. I get them from childhood books. If I Built A Car and If I Built A House were inspired by Dr. Seuss. Blueberries for Sal and One Morning in Maine by Robert McCloskey; Horton Hears a Who! by Dr. Seuss; Where the Wild Things Are by Maurice Sendak; and Sylvester and the Magic Pebble by William Steig. What is your advice for young illustrators? Draw all the time. Draw from life. Put something on your desk, and try to draw it by looking at it directly. At the Rhode Island School of Design [a well-known art school], one of their requirements used to be to draw your sneaker, which is really hard. What is your advice for young writers? Read a lot, but read what you want to read. I’m really opposed to people telling other people what to read. And write about what you’re really interested in. Just because narwhals are really hot right now doesn’t mean that you have to write about narwhals.